AC Rating | What laminate rating is best for your home? Outside of appearance, what is the #1 thing people want in their flooring? This is why every type of flooring has specifications that indicate durability. Some floors require you to look at multiple specifications; others have a single specification. Some floors durability indicators are trustworthy; others are misleading. what AC rating do I need? do I need to look at anything else? 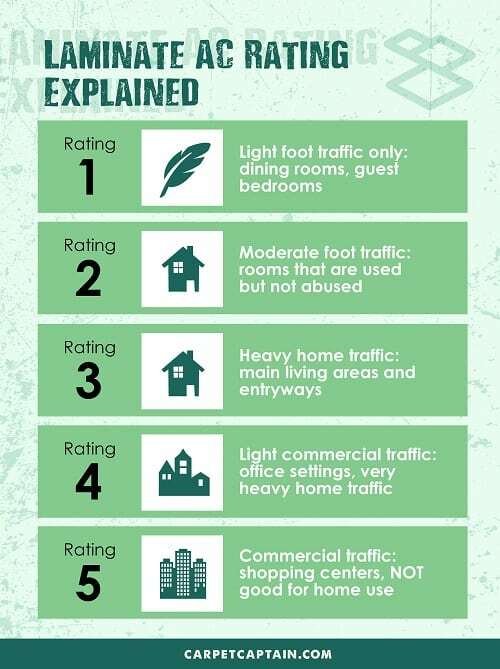 So, what is an AC rating? What are the tests? Rubbing sandpaper back and forth. Moving furniture legs and chair wheels. Exposure to heat/burns. Exposure to moisture. Impact resistance. Staining and more. Every laminate goes through each test performed by an unbiased third party. A 1-5 grade is given for each test, and the final 1-6 score is based on the lowest score the laminate receives. In other words, if a laminate received a score of 4 on every test except moving furniture on it was a score of 2, you would see the laminate rated as an AC2. Can the AC rating be trusted to determine durability? Yes. There aren’t many single scores I like for flooring. Many are biased or just inaccurate. The AC rating covers so many different ways that a laminate can wear, that the grade gives you a great idea of how durable your laminate will be. Captain’s warning! AC rating is a great durability rating, but just like all other floorings, other factors come into play. Big factors for laminate are moisture and how level the subfloor is. This can wreck the most durable laminate floor. Check out the laminate guide for more info. AC1 rated laminate is designated for the lightest homeowner traffic. This laminate can save you money, but only should be used in rooms without much traffic. Good examples are closets, rarely used dining rooms, guest bedrooms (that kids don’t play in), and possibly adult bedrooms if you don’t move furniture often. AC2 rated laminate can take some traffic but shouldn’t be used in high-traffic areas. This might include family rooms that aren’t the main play area but do see some activity. Or a bedroom that gets walked on more than just when you’re going to bed. AC3 rated laminate is the highest rating for homeowners and the lowest for commercial use. Homeowners can use AC3 rating to hold up in main living areas, hallways, and stairs. In some cases, AC3 may be acceptable for lighter commercial use, but I would receive it more for an office setting and not a store that gets daily public traffic. AC4 rated laminate is the first level designated for commercial use. Stores that receive public traffic or busy offices can use AC4 rated laminate to hold up to daily shoppers. AC5 rated laminate is the highest durability rating. It’s intended to be used in high-traffic commercial buildings: think busy restaurants, department stores, and large corporation traffic areas. AC6 rated laminate is rare, but you might see it. It’s a step up for extreme commercial use. Can AC4 and AC5 rated laminates be used in homes? I don’t recommend AC5 in homes for a couple of reasons. One is that you are likely overpaying. Yes, AC5 is durable, but it’s overkill for home settings. The second is that AC5 is often high-pressure laminate that has a rough texture. And when I say rough, it puts holes in some people’s socks and doesn’t feel great on bare feet (not a problem in stores because people have shoes on). AC4 is somewhere in-between. I still think AC3 is durable enough for 95% of homes. But if you find a can’t-beat price on AC4, you can consider it… just make sure it’s not too rough underfoot before committing to having it installed. Now you know enough about laminate’s #1 durability rating to choose what’s best for each of your rooms and not overpay. I love AC ratings because they’re unbiased and cover a wide-range of things that could damage your laminate. And to take it a step further, it’s graded on the lowest category it receives. This means your less likely to get misled by it. If you want laminate to last in a room you use, I’d go with AC3. If you plan on moving, changing floors soon, or flooring a room with not as much use, consider AC1 or AC2. Now you know how to choose the durability of your laminate like a pro, just make sure you have all of the other important decisions covered.